A drop quote puzzle consists of two parts — a grid of squares and a set of given letters which “drop” into the grid. When the puzzle is solved, the grid will be filled in with a quotation or other statement. Within the grid, blocks represent the spaces between words, and punctuation, if present, will already be placed. Each line in the grid is filled completely, so a word may be broken between lines, starting at the end of one line and continuing to the beginning of the next line — words only end at blocks or the end of the puzzle. 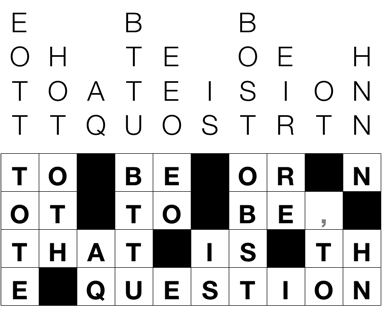 The given letters at the top of a drop quote puzzle are organized by the column they “drop” into, and are given in alphabetical order. Use your knowledge of the language and process of elimination to figure out where each letter goes. As you fill letters into the grid, tap on the letters above the grid to mark them off. If you realize you’ve marked off a letter by mistake, tap on it again to remove the mark. Isolated boxes are usually, but not always, the words A or I. Similarly, there are about 100 2-letter words, and only about 25 of them are common. When you have a 2-letter word, see what words you can make and then see what letters that leaves you over with for other lines. The most common 2-letter words are: OF, TO, IN, IT, IS, BE, AS, AT, SO, WE, HE, BY, OR, ON, DO, IF, ME, MY, UP, AN, GO, NO, US, AM. While there are far more 3-letter words, think about the most common ones, which are: THE, AND, FOR, ARE, BUT, NOT, YOU, ALL, ANY, CAN, HAD, HER, WAS, ONE, OUR, OUT, DAY, GET, HAS, HIM, HIS, HOW, MAN, NEW, NOW, OLD, SEE, TWO, WAY, WHO, BOY, DID, ITS, LET, PUT, SAY, SHE, TOO, USE. Apostrophes indicating contractions can be a big help, because there are only a few letter combinations that follow an apostrophe. The two most common letters after an apostrophe are S and T.
Sometimes, the letters in a column with fewer letters can be placed quickly by noticing which letters must be consonants and vowels, or by eliminating the possibility of a letter appearing in a certain spot. If you have an uncommon letter such as a J, K, Q, X, or Z, think about what letters might go before or after it. Similarly, look for common consonant pairs such as TH, ND, NT, ST, as well as doubled letters. Be alert for common prefixes such as DE-, MIS-, RE-, and UN-, as well as common suffixes such as -ABLE, -ED, -ING, -LY, -NESS, and -TION. Every time you fill in a letter, it means that you’ve eliminated some letters that can go elsewhere. Frequently, this means that you can immediately fill in some additional letters. If all else fails, don’t forget you can get hints by tapping on the icon and revealing a letter in the grid. It’s not cheating to ask for a hint — the goal is to have fun, so if asking for a hint increases your enjoyment, feel free.